The 2017 season kicked off with much fanfare regarding weedy rice. Thanks to the vigilance of the entire rice industry, the UCCE Rice Advisors received many calls regarding weedy rice, starting in late June, as growers finished their herbicide applications. Calls continued to come in through July and August. 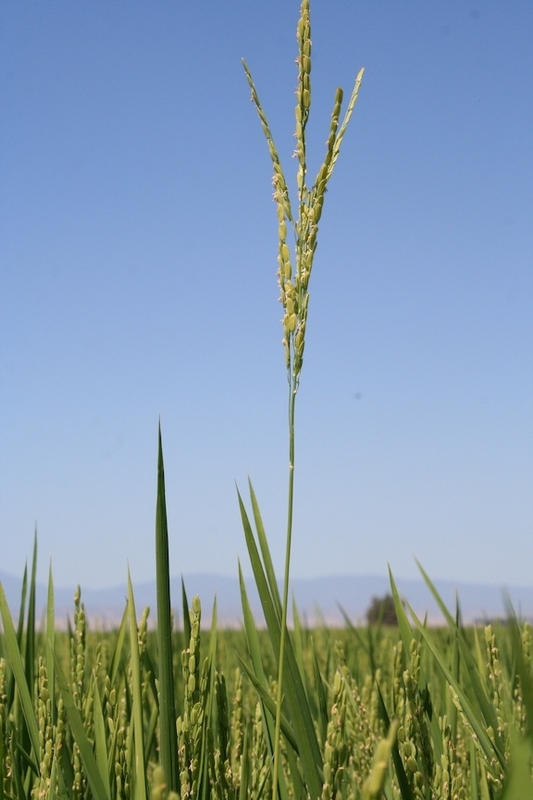 The California Crop Improvement Association (CCIA) began inspecting fields as the rice headed, and suspected plants were pulled and sent to the UCCE Weedy Rice Team for genetic testing. There were many calls throughout the season, which indicated that everyone was out inspecting their fields. Thankfully, many of the calls were not weedy rice! 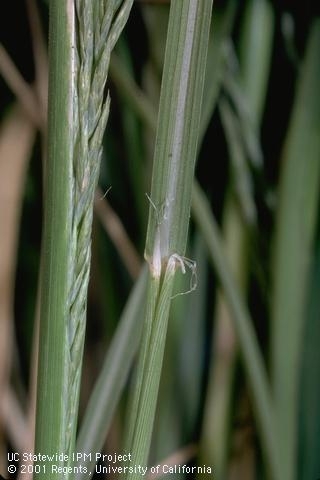 1) Sprangletop: like rice, it has a ligule, so early in the season, before heading, it may be easy to confuse it with weedy rice. However, sprangletop has a white stripe down the middle of the leaf (mid-vein). 2) Elongated Upper Internode (EUI): this is a genetic abnormality of common medium grain rice varieties that causes the part of the stem attached to the rice panicle to elongate. The panicles stick up above the canopy, just like weedy rice. However, the rest of the plant will look just like the variety planted in the field. 3) Bakanae: this disease of rice causes the plants to elongate and appear taller than the surrounding plants, and they also appear lighter in color. However, any panicles produced by the infected plants will be blanks. 4) Fertility Differences: if the field has more or less nitrogen in certain areas, some of the rice plants may appear lighter in color than others. Elongated upper internode (left) and sprangletop (right) can be confused with weedy rice plants. We have been working on characterizing some of the biological characteristics of the weedy rice populations. We made considerable progress over the summer, and are happy to report that the dormancy and shattering status of each of the five populations is now known. All weedy rice types found in California so far are high shattering, which means that many of the seeds will fall off the panicle before harvest. Therefore, it is critical to remove plants from the field before they can shatter completely. Any seeds shattering on the soil surface will have the potential to be deposited into the soil seedbank, lengthening the amount of time weedy rice will be infesting the field. 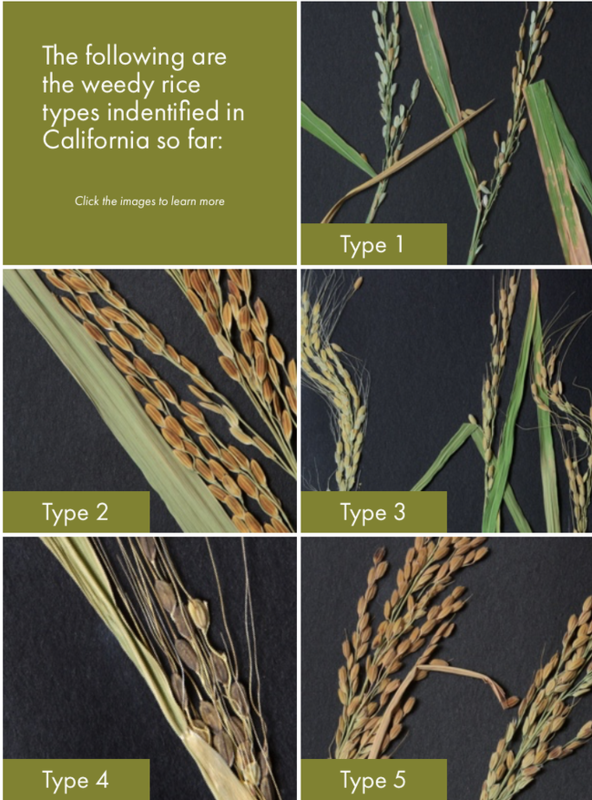 Three of the types found in California have high dormancy: Type 1, Type 3, and Type 4. High dormancy means that once the seeds are in the soil, they will remain there for a long period of time without germinating, even if the grower is doing everything possible to get the plants to germinate so that they can be killed. Two of the types have low dormancy: Type 2 and Type 5. These types will readily germinate the following spring if they are close to the soil surface, so they can be more easily eradicated from a field, if a grower follows all best management practices. Summary: We Are Working Together! Overall, grower and PCA participation in scouting for weedy rice was really high in 2017. Since we can only get rid of it if we know that it is there, this is very encouraging, and we hope that the participation continues into the future. Likewise, those growers that already know they have weedy rice infestations are working hard to eradicate it, following the Best Management Practices. Again, this is very encouraging, as the only way that we can eradicate this pest is as a group, working together.